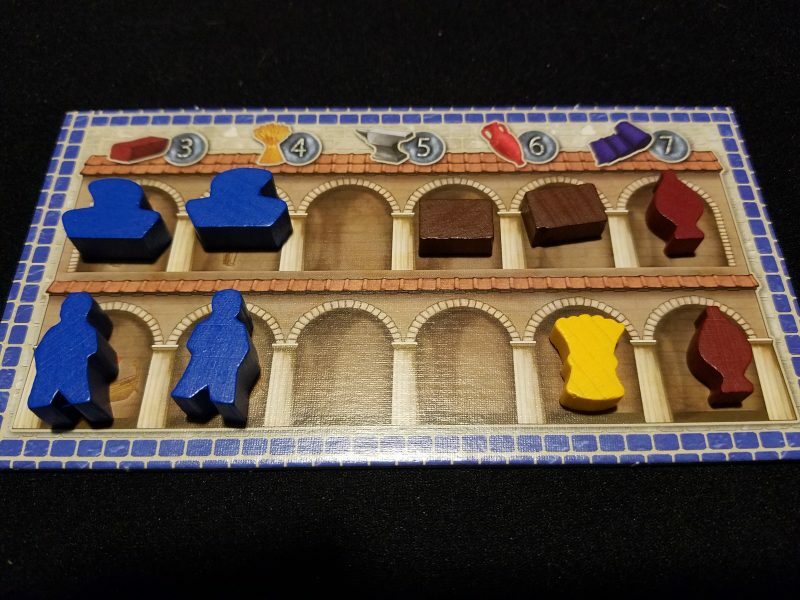 I’ve been learning and playing a lot of new games recently, but none of them have made the impression that Concordia has after only one play. It’s been a few days and I’m still thinking about strategic possibilities and how I want to try to tackle this puzzle of a game the next time I play. Like many people, I first heard about Concordia when Shut up and Sit Down gave it a glowing review. However, by that point I’d found that my gaming tastes had drifted away from them, and I was less likely to buy into any hype they were serving. Sure, it was a Euro game, and they made it sound like a fantastic time. But even though these were the folks who still spoke fondly of crunchy Euro mainstays like Terra Mystica, I found myself suspecting that Concordia was probably a too-light, too-social experience for my keen analytical mind. Elitism feels nice until you realize how dumb it is, and boy was I wrong here. I decided to give it a shot after Michael from Meeple Like Us said it was his favorite game on the podcast and I am so glad I did. The first play of the game had everyone grinning from ear to ear at how magnificently clever it is, before grinding us down with its elegant but difficult resource puzzles. See, Concordia has all of the trappings of your run of the mill economic/trading Euro. There’s cloth and brick and little wooden ships and storehouses and cardboard coins and it’s even played on a map of the Mediterranean. I think the brilliance here isn’t so much one of originality but of being, in each individual mechanism, better than you would expect. Please don’t judge it by its cover. And don’t worry, I’m going to be going on and on about these delightful mechanisms. But first, the conceit. 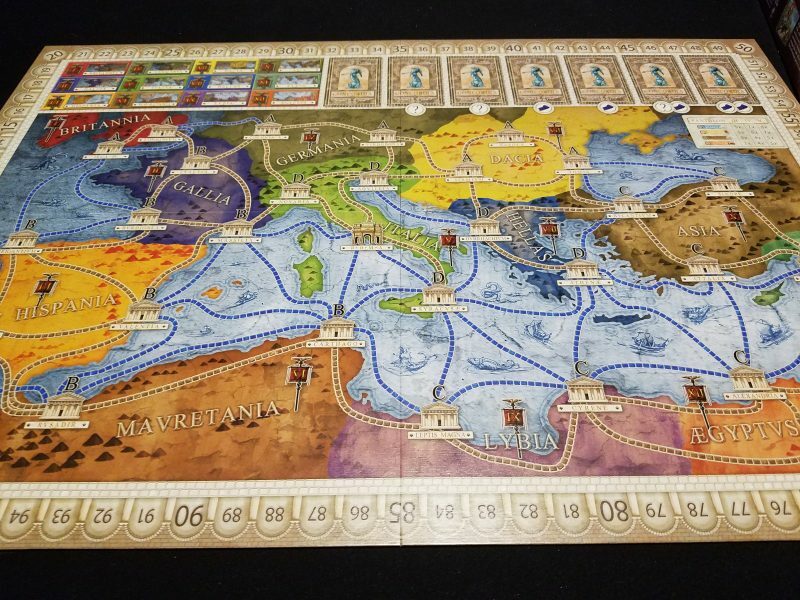 Like I said before, Concordia is very much in the infamous “trading in the Mediterranean” sub-genre, though that’s never bothered me as it does some. You’re going to start at Rome and expand your trading network by sending ships and people across the land. At cities you can build buildings which give you access to the goods there (of which there are 5 kinds). Acquiring goods and expanding your trading network is really the entire point. Actually the whole point of the game is hidden until you get to the end of the (surprisingly short) rulebook, where it finally explains scoring. It was at that point in the learning process that I knew that I was going to love this game. There’s a card that begins with the player last in the turn order that doubles the primary production of the “prefect” card. After they use it, it passes counter-clockwise. So you want to time your use of the prefect card until you get this boon. But the prefect card is the main way of acquiring resources, which is what you need to do pretty much anything, so you might be diminishing your overall efficiency in order to make this one particular card more efficient, which might not be the best play at all. But how to calculate it?! When you use the prefect action, you choose a province (out of 12 on the main game board), and get the resource shown, plus all of the cities in that province produce resources for the people who have buildings there. Like with Dominant Species, another brilliant area control game, it’s beneficial to completely dominate a province early to maximize how many resources you get there, but there’s also the potential for a strategy where you poke your nose into as many provinces as you can to turn other people’s prefect actions into passive income. I sort of wish there was more of a distinction in those two strategies, though, because even in a 3 player game on the big map, we were all up in each other’s geographical business during the latter third of the game. Similar to Power Grid, you can build where someone else has built, but it becomes more expensive as more people build there. A little tidbit: the basic resources gained from the prefect action are pseudo-randomized, and they’re skewed towards the more valuable resources like cloth. This allows players to get expensive resources early, which not only allows them to invest those resources into getting more of that resource later on in the game, but it provides a bit of a tempo boost to help everyone get their engines going. Without that small bit of influence over the random setup the game would drag a lot in the beginning. I get the feeling I’m going to be saying this a lot in the review, but that’s good game design. Last bit about the prefect action: when you produce in a province you flip over the resource tile, blocking someone else from producing there again. On the other side of the tile, however, is the image of one or two coins. When you use the prefect action, instead of producing resources, you can instead take all of the coins shown to flip back every tile to its resource side! It’s an adaptation of a mechanism I first saw in Puerto Rico (then again in Small World and Twilight Imperium) and I think this might be my favorite implementation yet. Just like nearly every mechanism in this game, it controls the pace of the game, tweaks the choices given to players (as they might not be able to produce in their preferred province), and creates increasingly more difficult decisions (as the incentive to grab those coins increases). But most beautifully of all, the entire complex web of decisions and incentives moves because of the choices of other players. This game could be seen as a bit multiplayer-solitaire if you squint, but I don’t think anyone’s going to ever accuse it of that because you feel the impact of every other player’s decisions. It’s also displayed on a grid. I LOVE GRIDS. Speaking of interaction, the diplomat card is fun. It lets you copy a card at the top of one of your opponent’s discard piles. Again, this works on multiple levels. It allows you to sneak out additional actions that your deck wouldn’t otherwise allow you to do, which can give savvy players a leg up. It gives you tough decisions because, while utilizing a powerful card your opponent just played might not be the best move from a timing perspective, this might be your only chance to piggyback on that action for a long time. And, of course, it’s entirely dependent on the actions of your opponents. Analyzing the board and timing a chain of actions dependent on a precise use of the diplomat is a gamble, but if you’ve correctly predicted what your opponent will do, it’s a fantastic gambit to pull off. Concordia is a puzzle, one that you’ll be familiar with if you’ve played anything like Terra Mystica or Tzolk’in. But here, even more than in those excellent games, it’s an interactive competitive puzzle, where everyone is straining against each other, trying to gain an edge in the fight to economize the best. The puzzle itself is shaped by everyone’s collective actions, making the first play, at least, feel like you’re trying to do math while someone else keeps rearranging the numbers in the equation. Ok, that’s a terrible metaphor, but I mean it in the most complimentary way possible. Here’s a better metaphor: Concordia also feels like a collection of chicken and egg problems. Gaining resources costs resources, and it’s sometimes stupidly frustrating. Brick is required to place a building in any city except the ones that produce brick. What do you need to build there? Food. How do you get food? Producing with food buildings. So maybe you do a couple of trades in the market to get what you need, or utilize a double-strength prefect action. But now you want more colonists to spread out your empire and hit those untapped cities. Colonists cost food and tools, and it costs food and tools and bricks and money to get a production engine going there. But to get a production engine you really need to geographically get to remote areas of the map, which requires more colonists to do effectively. Cloth is awesome, because it’s worth a ton of money, and you can usually grab it with a prefect action. So you use cloth to finance the rest of your empire. Except that the prefect action is less and less cloth-efficient (relative to the other goods) as the game goes on now, and you need cloth (and bricks and money) to build up a cloth engine. Oh, you also need cloth to snag the good cards from the supply before your opponents take them. Confronting these dilemmas and digging your way out of them is a wonderful puzzle. Doing it well is tough. I don’t know if I’ve ever made so many moves in the first play of a game where I clearly knew that I was playing sub-optimally because I hadn’t seen well enough what resources I would need. This game is hard. Not hard in a Vlaada Chvatil kind of way where you’re trying to dodge calamity. Hard, as in, you’re going to know that you’re playing poorly throughout the game because you just didn’t have enough knowledge or enough foresight to plan as precisely or as deeply as you should have. Taunting your lack of foresight is the tribune card, which lets you shuffle your discard pile back into your hand. If you’ve planned ahead well and your discard pile is plump, you’ll get a sprinkling of cash as a reward. What a tease. AP-prone people may want to give this a test run before buying. And now we get to final scoring, which (and I know I sound like a broken record) is beautiful. There are 6 different areas everyone scores at the end of the game. All of them have to do with having colonists, having goods/money, or spreading your buildings across the board. However, each scoring category is associated with different cards, and each individual card you have by the end of the game scores. Let me break this down for you. The “Jupiter” scoring category gives you one point for each building you’ve built in a non-brick city. You’ve got 15 buildings to begin with, and maybe you build 12 applicable buildings by the end of the game. 12 points, great! But maybe throughout the course of the game you’ve built up 5 different Jupiter cards in your deck. So you’ll really be getting 12*5=60 points. Every single card will give you points some way or another, so the pure quantity of cards that you collect matters. But the points you get per card are dependent on what you do on the game board. Both of those things cost valuable resources. How do you spend your resources to maximize points? Do you try to collect a bunch of cards? Do you shoot for only a couple of scoring categories and try to maximize them? 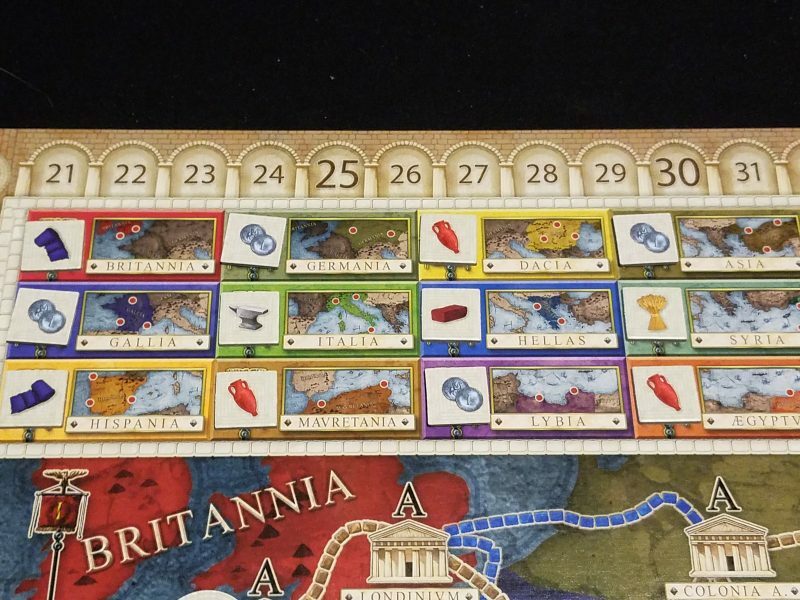 Do you build up a giant empire on the board and only try to grab additional cards at the end? My guess is, after one play, at least, that there are a few general strategies that may work, although I can’t be confident about that at all at this point. Don’t forget that how you spend your resources also determines how well you gain resources. Combining scoring and engine building so tightly can’t be an easy design task to pull off, but I think Mac Gerdts might have done something truly special here. However, I do have to temper myself. I’ve only played the game once, and while it was a fantastic first play experience, I do have some worries about the long-term viability of Concordia. First, I fear that optimal openings might bring down the beginning game a bit (maybe they’ve already been discovered, but I’m sure not going to try to find them). Like with Scythe there could be very specific lines of play that are just economically better and repeatable. There’s some randomness with the setup, but I fear that there might not be enough randomness to avoid this problem. On the other hand, if there was too much randomness, elements like in what order the cards come out on the display and turn order might have too much of an impact on the game. This is an incredibly fine line to walk, and while my gut says that Gerdts has pulled it off, my head knows that I need to play it more before I can know. Second, this is a point salad game, which means there are some inherent issues that arise from that. Fundamentally, there’s a point floor, so while final scores in our three player game centered around 120-130 the real battle is over maybe ⅓ of those points. The rest are given through the natural course of playing the game. This creates a disconnect between playing good moves and understanding exactly how good those moves are. Again this is a fine line that has to be walked in any game of this type, and I can’t be certain how well Concordia has done it at this point. My head says that this is exactly the kind of game that can probably be figured out with a moderate amount of play, and that avoiding that fate is so difficult to design. My heart says that I should trust my first impression and just declare it a masterpiece. Combining my first two worries a bit, I also worry that this game will have that Puerto Rico problem, where there’s so much interaction between the players that a new player making the wrong play at the wrong time can allow a more experienced player to catapult into victory courtesy of their blunder. I also sort of wish that there was more variety with the cards. There are only a couple of card types that only exist outside of your starting hand, so the deckbuilding aspect is more about how many of which cards you get, rather than charting a unique strategic path with your deck construction. Finally, as I said before, analysis paralysis prone players beware. The last time I was caught up in so much calculation and resource conversion and struggling to make long term plans was my first play of Terra Mystica, and I think Concordia may be more brutal than it. Needing to sort of keep track of everyone’s decks and utilizing the diplomat card in particular can grind your thought processes to a halt as you struggle to sort everything out. It started giving me a headache, and, being my first play, I wasn’t even trying that hard to optimize my actions. But that’s what makes the game so alluring. That’s why I want to play it again immediately. It’s a feat of game design to make a first play so simultaneously exciting and elusive. So even if it does go south a bit after the fifteenth play, I can confidently say right now that Concordia is fantastic. Here’s hoping it only gets better. Nice and throrough article about Concordia. It’s also one of my new love-interests due to Quintin Smith & Co’s raving review. It is so simple game to teach “play a card and do what it says” but the scoring and deckbuilding make it very interesting. We have the the Gallia/Corsica map expansion, and Corsica is awesome for 2 players. 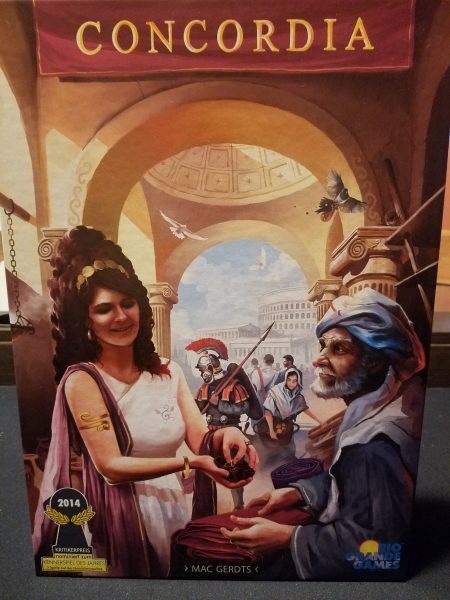 Recently we got the Concordia Salsa expansion and I’m looking forward to getting it to the table. Awesome. Let me know what you think of Salsa. I’m super curious about expansions for this already. Do the map expansions change the rules at all (like some of the maps for Power Grid)? Salsa proved to be an awesome expansion! Okay, the cover is probably the ugliest among our 300 or so games. The new wild good, salt, is a fine addition but surprisingly the new forum tiles were awesome. They offer a lot of new individual strategies. I have only played each map 1-3 times, and I haven’t found them to be as different as in Power Grid. In PG the amounts of certain fuels in different maps made a real difference. In Concordia I don’t feel such an impact. It’s mostly about fitting the map to the number of players and giving a bit of variability. This sounds exactly like the type of game I’d adore… I absolutely want to play this next time I come up. Yes! And do it sooner rather than later. I’m down to play Concordia 100% of the time for the near future. But I have so many vacations coming up. I very much doubt I’ll see you until PAX unfortunately.